Over the next few weeks on this blog I am going to offer you my perspectives on this new pedagogy. For many of the reasons already well explored in the press and the blogsphere and for a significant number of other reasons not touched upon, higher education is at a critical juncture. This juncture, whilst not one spelling the immediate doom-laden end of the world as know it, is almost certainly constructed from elements of a perfect storm. A financial crisis placing severe and not-unpopular pressure on funding, rampant conservatism even from left-wing governments, technology reaching a point of saturation and ubiquity that makes its use in education expected and almost seamless and two-tier university system that has empowered the market leaders with enough clout and know-how to eliminate the competition in an entirely un-collegial way. One of the consequences of the overhyping of MOOCs has been an increased public interest in peer-led learning and peer assessment. The obsessive interest in the numbers engaged in MOOCs (thousands enroll! 650 messages in a day!! 4650 blog posts this week!!!) places the emphasis on the quantity of interaction against the quality of learning that is occurring through that interaction. Many MOOCs use the methodology that asks learners to post something to a forum and through the magic of comment aggregate other people interested enough to read and contribute together. The result is a long trail of posts on a discussion forum that are neither social nor interactive but more like a presentation to a room where almost everyone is asleep. This seems like all we have done is move the broadcast model from ‘lecturer to learner’ over to ‘learner-learner’ because we can’t find a pedagogical model economic enough to deal with the MASSIVE part of the acronym. Social interaction is a complex beast. Emotions, attitudes, personality, identity, meaning, authenticity and emerging senses of realness all play into constructing our approaches to social interaction. Each different social media platform that emerges changes some or all of these bases. Facebook widened our networks and reached out to people who in the past time may have forgotten (or at least temporarily until the next high school reunion). Twitter made connection management more manageable by limiting the scope and duration of the social interaction to 140 characters. Google analytics has made the study of numbers accessible to any blog owner as they check the length of engagement with their content daily. But as with the MOOC, numbers seem outrank the quality of the engagement. One of the issues that arise for me with the MOOC model of peer interaction is the initial assumption that all interactions are equal and that all those who interact are the same. Sure, contexts vary and the time given to the programme is also variable. However, social interaction is not always conducted amongst equals – people play different roles in the group. Cross and Prusak (2002) looked at the formation of informal communities within organisations and argued that one of the critical aspects of a successful community was the ability to share knowledge between people as opposed to knowledge simply originating from sources. They defined four roles within these communities; central connector, peripheral specialist, boundary spanner and information broker. Whilst these roles primarily represent modes of organisational interaction, they have been utilised in a number of studies to categorise and explain the behaviours and practices of social interaction, social networking and personal interaction in informal settings, and support the basis of effective social networking and engagement engaging with experiences. A focus on metrics, whether this is completion rates, measures of time spent on the website or hits to a youtube lecture, ignores the critical notion of learning. Simply digesting information from someone else, whether it is open, remixed, funky or interesting is still that – digested information. Tapscott and Williams (2010) argue that collaborative learning and collaborative knowledge production represent the necessary future of modern higher education. A fully integrated web 2.0 approach linked with a pedagogy that is designed to fully utilise the benefits of social construction and collaboration requires significant change to both the practice of teaching and the practice of learning. Simply asking learners to digest material and then post about it, often in isolation and asynchronously disconnected from their peers doesn’t support the sharing of context. So much of the interaction in online programmes seems to be predicated on forcing communication without listening or interaction. It also does ask the learner to reveal much of themselves, challenge their perceptions or learn from someone other than the disassociated academic, represented here often as a talking head and not much else. The temptation then becomes to focus on the medium and not the message. It is common to see discussions about the platform, the course or the concept of a MOOC (what I call the #metamooc – hashtag it!) to be one of the few topics that engage people in actual social interaction. 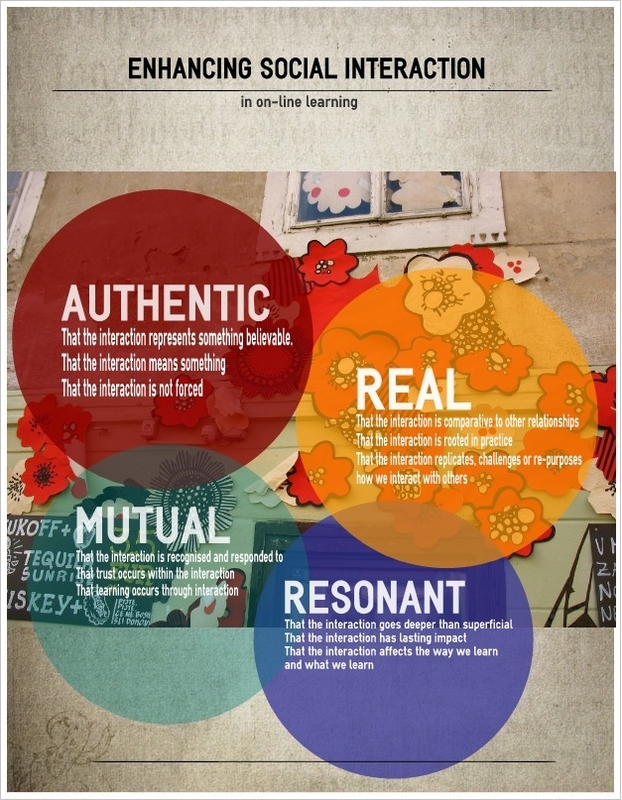 Social interaction within a programme needs to be authentic and resonant. This matters whether the programme is virtual or face-to-face. The role of the academic is critical. They help create the conditions under which engagement can occur. They also help create the environment in which interaction leads to learning. In a MOOC world, this role is disconnected from the Massive because there is no recognised pedagogy that can economically connect it. Aside from the obvious assertions of developing a better understanding of interaction in order to facilitate it, there are four things that I believe can enhance the impact and practice of social interaction in education. This isn’t a how-to list nor are they exclusive, because I know there are other things that make social interaction work. That the interaction represents something believable. Like I said above, I won’t argue that this list is the panacea to solving the age old problems of on-line interaction in education. I will argue that simple measures of performance such as clicks and analytics and metrics only help to measure the MASSIVE aspects of a MOOC, and that this element is not pedagogical in nature. It is a measure of economic feasibility and success. The OPEN aspect has already been corrupted to mean free from cost not from copyright. All that really leaves as pedagogical is the mode (ONLINE) and the concept (COURSE). And these elements are at the mercy of the financial reality created by the MO bit. (Cross, R., & Prusak, L. (2002). The people who make organizations go-or stop. Harvard Business Review, 80(6), 104-112).